There's only one good reason to eat anything from Domino's: their online ordering means you can quickly order food without having to go through a human. Now they've made it so you won't even need a computer, just a Ford. The automaker has teamed up with the pizza maker on an app for its Sync AppLink system that will allow driver's to order Domino's through voice commands. 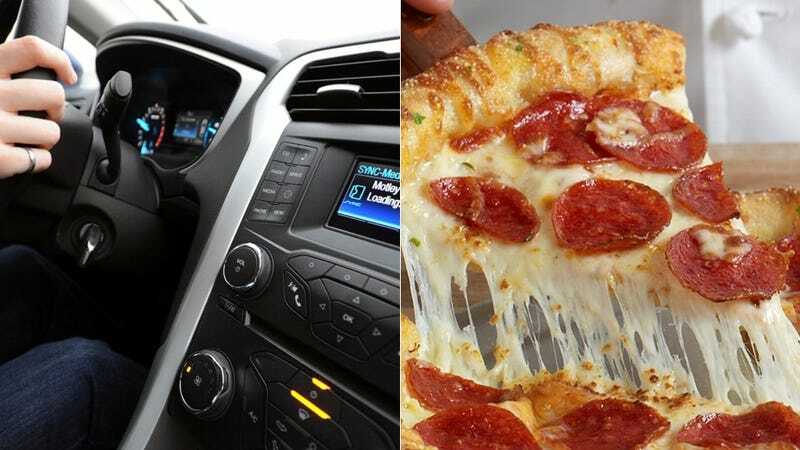 Users will have to set up a Pizza Profile with pre-configured menus through their Domino's mobile app, but it's relatively straightforward and expected to be available later this year on more than 1 million Ford products that have Sync AppLink. You just know this is going to make Americans even fatter. However, our Jalopnik Detroit correspondent Aaron says only one of Domino's eight Detroit locations actually delivers. Detroit is the rather large city that's next to Ford's global headquarters in Dearborn, which is also close to Domino's Ypsilanti home base. And the two companies play up "sharing a backyard" in the media release. Ironic. But maybe that's OK, since this will make ordering mediocre food far too easy if you own a Ford. Or not easy at all if you have MyFord Touch.